Learn more about our Los Angeles Marathon training program. Safe to say that 2019 will be our biggest Los Angeles Marathon (LAM) yet! 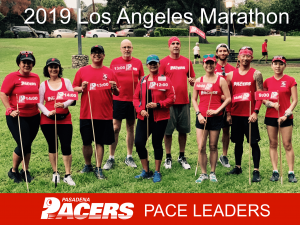 Since our very first LAM more than 20 years ago, we’ve helped and cheered for thousands of Pasadena Pacers as they trained for and crossed that LAM finish line. But, it takes a big team to pull it all off and we love them all. Here’s your chance to learn more about our coach, pace leaders, and support team.